Muammar Gaddafi, the deposed leader of Libya, died on 20 October 2011 during the Battle of Sirte. Gaddafi was found hiding in a culvert west of Sirte and captured by National Transitional Council forces. He was killed shortly afterwards. The NTC initially claimed he died from injuries sustained in a firefight when loyalist forces attempted to free him, although videos of his last moments show rebel fighters beating him before he was shot several times. The interim Libyan authorities decided to keep his body “for a few days”, NTC oil minister Ali Tarhouni said, “to make sure that everybody knows he is dead.” To that end, the body was moved to an industrial freezer where members of the public were permitted to view it as confirmation. Gaddafi’s body was publicly displayed in a freezer in Misrata until the afternoon of 24 October. Video shows Gaddafi’s body on display in the center of an emptied public freezer in Misrata. Some people drove hundreds of kilometres across Libya to see proof that he had died. One viewer of the body said about the public display of his corpse, “God made the pharaoh as an example to the others. If he had been a good man, we would have buried him. But he chose this destiny for himself.” A Reuters reporter who saw the body said that there was gunshot residue on the wounds, consistent with wounds of people when they are shot at close range. Gaddafi’s body was displayed alongside that of his son, Mutassim Gaddafi, who also died in the custody of Misratan fighters after his capture in Sirte on 20 October. The younger Gaddafi’s body was removed from the refrigerator for burial at the same time as his father’s on 24 October. Do.Pe. Press, Paraguay Press, Edition of 2.000. Silkscreen cover, color ill. This publication is the first monograph of American artist Oscar Tuazon. It accompanies the exhibition Bend It Till It Breaks, organized by Chiara Parisi and presented at Le Centre international d’art et du paysage de l’île de Vassivière (Ciap), November 15, 2009-February 14, 2010; Oscar Tuazon, organized by Philippe Pirotte and presented at Kunsthalle Bern, February 13-April 25, 2010; and the exhibition with Elias Hansen, It Was One of my Best Comes, organized by Sandra Patron and presented at Parc Saint Léger – Centre d’art contemporain, March 20 – June 6, 2010. Edited by Oscar Tuazon, Thomas Boutoux, Pierre François Letué, and Dorothée Perret. Born in England in 1964, Liam Gillick emphasizes his roots in postwar Europe and his consequent distrust of authority as major influences in his curatorial techniques and artistic practices. Currently working in London and New York, “engaged with the processes of the everyday,” he rejects the use of the term “contemporary art” citing it as historical and redundant. Working in a variety of different mediums including large-scale installations, inkjet prints, and music, as well as curatorial projects and theoretical writings, Gillick’s work transcends disciplinary categories. In 2009, he was selected to represent Germany in the Venice Biennale, and he was nominated for the prestigious Turner Prize in 2002. Gillick has been the subject of numerous exhibitions, including a retrospective at the Hessel Museum of Art at Bard College in 2012, as well as solo shows at institutions including the Museum of Contemporary Art in Chicago (2009), Rotterdam’s Witte de With (2008), Kunsthalle Zurich (2008), the Palais de Tokyo in Paris (2005), and the Museum of Modern Art (2003). He has also contributed to magazines and journals such as Frieze, Artforum, and October. A Balloon to Allah, Nefise Özkal Lorentzen, 52 min, Documentary. Norwegian-Turkish filmmaker Nefise Özkal Lorentzen wants to send a balloon to change the role of women in the Muslim culture. By following her grandmother’s path as a ‘sufi’, she embarks on a journey to rediscover the Islam of her mother’s mother. The film switches between her actual journey and her dreams. She experiences the diversity of Cairo, Istanbul and Oslo by drinking tea with the Egyptian feminist Nawal El Saadawi, finding hope and inspiration in the life of the 90-year-old author Gamal al-Banna and meeting a young Salafist. On her journey through the labyrinth, it dawns on Nefise that Islam is not the only place to search, but that there are correlations between the three Abrahamic religion and the oppression of women. Partly, perhaps as an act of mourning; more obviously as a reparative act, Lijn conceived of her manipulation of prisms as giving them a kind of restorative posthumous existence to remedy their mutilated identity: “A prism on its own is lost. It has no feet, no legs to stand on”. Her fantasy ran that they had lost their function in a world of technical forms by no longer being “anchored into a machine, which one way or another will be a machine for seeing… I must give it a body”. Liliane Lijn (born 1939), is an American-born artist who was the first woman artist to work with kinetic text (Poem Machines), exploring both light and text as early as 1962. She has lived in London since 1966. Harm van den Dorpel (born 1981 in Zaandam, The Netherlands) is a Berlin-based conceptual artist. With his work he investigates aesthetic hierarchies and cybernetic organisations of art and contemporary visual culture in general. He explores how intuitive associative expression, and algorithmically structured information systems can operate in hybrid. His practice includes sculpture, collage, animation and websites. He is regarded a key figure in Post-Internet art. Harm van den Dorpel is represented by Wilkinson Gallery in London. His work has been shown in the exhibition ‘Free’ at the New Museum in New York, and the survey exhibition ‘Art Post-Internet’ at The Ullens Center for Contemporary Art. Gert Robijn’s exhibition Happy New Year shows six new pieces. They are characterised by a clear style and referring to everyday situations. Themes such as perception, organisation and classification are treated in an instinctive manner. Elementary scientific experiences are being displayed in a minimal fashion. An apparently new balance arises between concepts such as light/heavy, below/above, covered/uncovered, visible/invisible. The items on display have their conventions taken away, renewed, as if they had been painted over. The objects have been placed in various ways on formica-coated showcases, which remind one of shapes that can be found in every house. Refrigerators, kitchen units, occasional tables, white, austere blocks. The sides are sometimes interrupted by a shade of grey, which makes one hesitate between a constant shadow and an area of colour. Robijns’ Liter shows two milk cartons on the level of a kitchen table. While one is still in its recognizable, original condition, the other has had its top removed and has been filled with a plastic bag containing exactly 1 litre of water. This bag partly droops over the carton in small folds. One appears to be light, the other heavy. New Balance also seems to refer to heaviness and weight. Two shoes crushed under the edge of the case. A similar, absurd scene can be found in Dieet. An empty packet of biscuits is being displayed on a lower case. The glass has been positioned right in front it. As if a passer-by hastily ate the contents and then walked off. The shape of the showcase has been applied in a more complex manner in the work Lijn N°5. There it functions as a machine, maybe a fax or a printer. Five pencils, that can draw five straight lines, are submerged in the wood. Right underneath is a groove where paper can be inserted or taken out. Scanner is another example of a machine that has been brought back to utter simplicity. It shows how two loose objects can represent a very complex device like a scanner. Happy New Year shows five diaries of different sizes ranging from a small pocket size to a double A4. This work visualizes the difficulty of predicting how busy the year will be, how many new exhibition projects and artistic productions there will take place. Leckey conceptualises the past and present through his “performance” piece entitled Sound Systems, an on-going project since 2001. 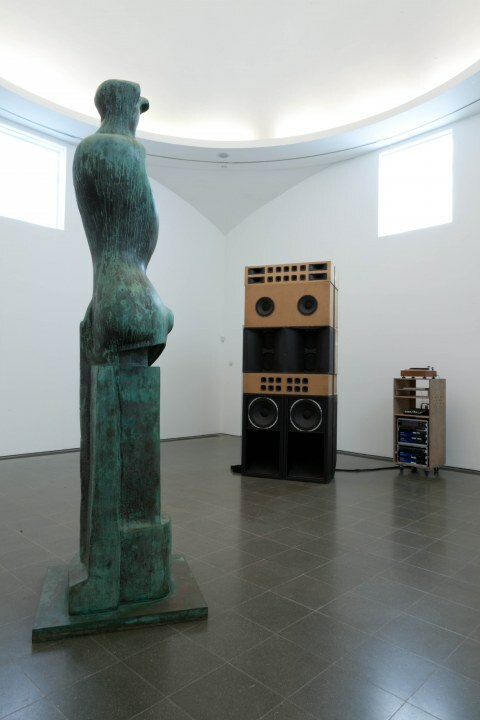 In the central space of the gallery, a tall bronze sculpture by Henry Moore faces a large stack of speakers, which appear to mimic the sculpture in terms of height and verticality. It seems as if Leckey has purported to match the present with the elegance of the past, as the arrangement of the erected sculptures assume an authoritative presence in the otherwise, empty gallery. The only other piece exhibited is a small poster that functions to inform visitors of the upcoming dates of performances, for the sound art changes week to week. 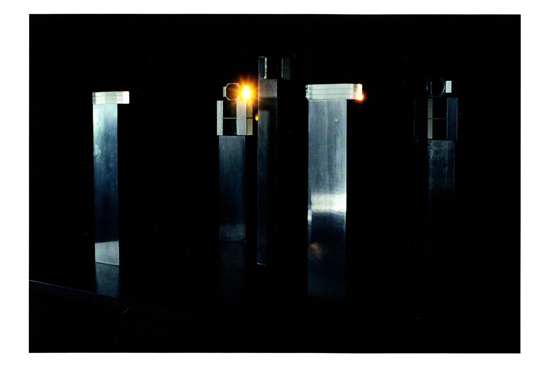 The performance aspect of Sound Systems relies on the sound emanating from the speakers that aims to elicit a response from the Moore sculpture. The sound I experienced was irregular and menacing, reminiscent of the immense roar emitted by furnace/exhaust. It was however, very sporadic, often occurring in fifteen-minute intervals. Between the moments of vibratory clamor were low grumbles and humming that verified its animate existence. While occasionally unpleasant, the inclusion of sound, particularly in relation to the sculpture, achieves a theatrical presence that renders a true sense of chemistry in the communication between past and present. While its status as a performance piece could be debated, Leckey’s final installation entitled GreenScreenRefrigeratorAction also exhibits aspects of theatricality. The temporary transformation of the gallery into a green screen not only provides a visual connection to the grassy fields of Kensington Gardens, but it also served as the backdrop in the production of the film that is exhibited here on two mounted flat screens. Located between them is the focal point of the work, the black Samsung “smart” refrigerator. Both the fridge and the Samsung name appear almost constantly throughout the film, whether seen against a natural landscape or viewed internally, in a scientifically-charged description that concerns its inner workings. The fridge not only stars in the video, it narrates it as well, in a muffled, robotic voice. The artist has reinvented the concept of the readymade by conveying its animate status in connection to the worldly, and out-of-worldly, environments. 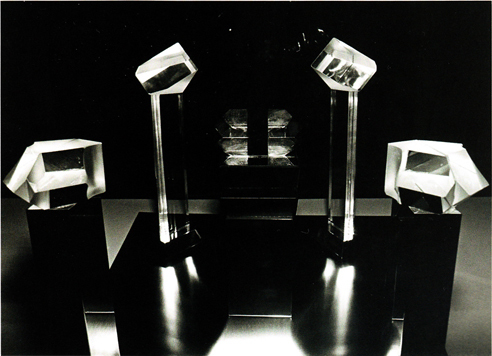 While Leckey’s elevation of the object to cult status may be interpreted as wildly propagandistic, it could conversely be interpreted as a commentary on technological advancements, particularly “smart” products which possess the abilities to think and function on their own in correspondence to the needs of its user. Thus not only do we become more dependent on these objects, but we form relationships with them as well. GreenScreenRefrigeratorAction may be understood as Leckey’s prediction of the future of technology in our lives, as well as its effects on the art world.